Let’s look at what properly formulated chain oil should do. 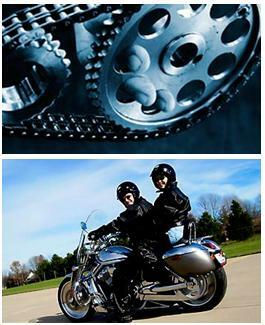 Firstly, it must help protect the chain from the most common cause of failure, which is rust. A carefully selected compound must be added that will enable oil to provide rust protection far beyond what it could do naturally and especially in those applications where moisture and humidity are present. Next, another major cause of failure is excessive wear. Oil by itself does provide limited wear protection and reduces friction. But, in today’s high tech world, the pressures and speeds encountered require far greater wear protection. A jerky start on a production line or a motorcycle will frequently break down a regular oil film and cause either seizure or extraordinary wear. Additives must be chosen that can prevent this. The right compounds can easily triple the film strength of regular oil and provide reliable protection under extreme conditions. The oil selected for the base of chain oil must have the right viscosity. If it’s too thick, then extra power or fuel is needed to get it up to the desired speed. If it is too thin, then it can fly off the chain too easily and create a mess. After the correct viscosity oil is selected a small amount of tackiness additive should be included. This helps the oil stay in place and reduces any fly off, even at higher speeds. Many petroleum base oils do not perform well at low temperatures as they tend to thicken or even harden to a solid similar to candle wax. In a snowmobile on a cold day this could prove disastrous. Oils that can perform at temperatures well below zero are essential in colder areas. Much care should be taken in selecting the right base oil to make sure low temperature performance is possible. Most people think refined petroleum oils are stable and never change — not so. Put a pure paraffinic high quality base oil in a pan and put it in the oven for a few weeks and you will begin to see it changing color — eventually becoming black tar. This is caused by oxidation, which is accelerated by heat. Fortunately, science has discovered chemicals that protect the oil from oxidation and let them retain their beneficial characteristics. If chain oil is subjected to any type of heat then oxidation is certain to follow unless it is protected by special additives. Chain Life from Protect All, Inc. is a fully formulated product that offers advanced solutions to all of the problems discussed above. It even has one more benefit, when used in an aerosol — it doesn’t squirt all over the area or drip down — instead it comes out as foam that lets you lay a thin stream on the chain thus reducing overspray and saving money. A great deal of time, testing and care has gone into the formulation of Chain Life and its regular use should provide maximum chain life and top performance.